CLEVELAND, Ohio -- The Browns are winless no more. Cleveland avoided that fate Saturday by beating the San Diego Chargers 20-17 for their first victory in more than a year. San Diego’s Josh Lambo missed a 45-yard field goal as time expired, giving the Browns (1-14) their first win in 377 days. When the kick sailed right, Cleveland’s small crowd erupted in celebration and Browns players poured off their sideline as if they had just won the Super Bowl. The Browns avoided becoming the second team to go 0-15, and no longer have to worry about joining the 2008 Detroit Lions as the only teams to lose all 16 games. 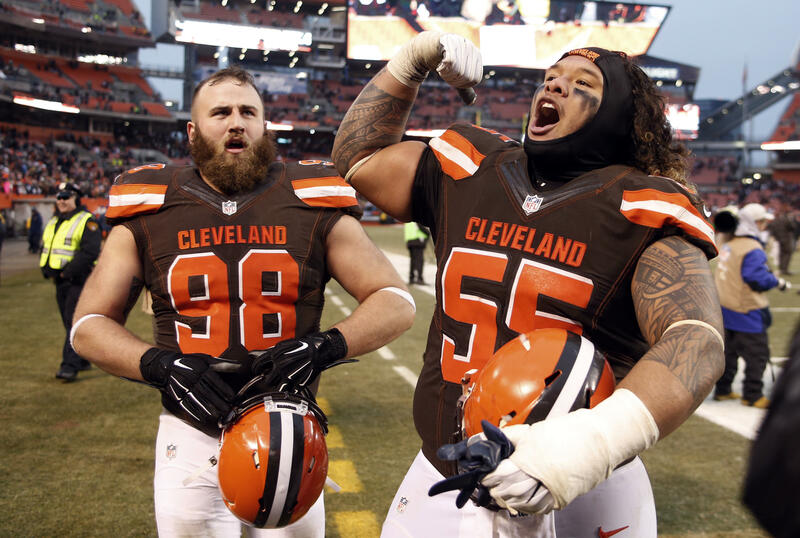 Cleveland built 10-point lead in the third quarter and hung on - defensive tackle Jamie Meder blocked a potential tying field goal with 3:49 left - to give coach Hue Jackson his first win with the Browns. The win also snapped Cleveland’s 17-game losing streak dating to last season. The Chargers (5-10) lost their fourth straight and one that could sting for a while. JACKSONVILLE, Fla. -- Blake Bortles’ best game of the season helped the Jaguars end a nine-game losing streak. Bortles threw for 325 yards and a touchdown, and was on the receiving end of a 20-yard trick play that sealed the win with 5:25 remaining. Rookie Jalen Ramsey returned an interception 30 yards on the ensuing play to set off a raucous - and long-awaited - celebration in Jacksonville. Bortles and the Jaguars (3-12) played inspired football and won for the first time this season at EverBank Field. Maybe they rallied around interim coach Doug Marrone. Maybe they played for ultra-popular ex-coach Gus Bradley, who was fired six days earlier . Maybe they just wanted to avenge an embarrassing loss to the Titans (8-7) on national television in late October. It was a debacle for the Titans, who had won three in a row and needed a victory to set up an AFC South title game next week against Houston. Titans quarterback Marcus Mariota appears to be done for the season, leaving late in the third quarter with an air cast on his right ankle. CHARLOTTE, N.C. -- The Falcons are back on top of the NFC South, capturing their first division title since 2012. Matt Ryan threw for 277 yards and two touchdowns, Tevin Coleman had 135 yards from scrimmage, including a pivotal 55-yard fourth-quarter TD run. The Falcons then had to wait about 3 ½ hours to celebrate when the Saints defeated the Buccaneers to seal Atlanta’s first playoff appearance in four years. The Panthers (6-9) were officially eliminated from playoff contention after making the Super Bowl last season. Ryan torched the Panthers for the second time this season. He threw for 503 yards and four TDs in Atlanta’s Week 4 win over Carolina at the Georgia Dome, a victory that set the stage for the Falcons’ playoff push. NEW ORLEANS -- Mark Ingram rushed for two-touchdowns and a game-sealing first down in the final minutes. The Buccaneers (8-7) needed a win to keep pace with Green Bay (9-6) for the final NFC wild-card spot, but couldn’t keep up with the Saints’ explosive offense. And their loss handed the NFC South to Atlanta, while giving the New York Giants a wild-card berth. Drew Brees was 23 of 34 for 299 yards and a touchdown for New Orleans (7-8), which gained 417 total yards and did not have a turnover against a with 26 takeaways - including three interceptions of Brees in the clubs’ previous meeting two weeks earlier. This time, it was New Orleans’ defense producing turnovers; Jairus Bryd intercepted Jameis Winston twice. The first takeaway set up Ingram’s second TD, and the second stalled a promising Bucs drive into Saints territory. Now Tampa Bay must win the season finale and hope for losses by Washington and Green Bay next week. If that happens, a complicated tie-breaker based on strength of victories will decide the final playoff spot between the Bucs and Packers. OAKLAND, Calif. -- Derek Carr threw three touchdown passes in the second quarter before leaving in the fourth quarter with an injured right leg. Carr’s injury leaves a dark cloud over the best season for the Raiders (12-3) in 14 years. Oakland clinched its first playoff berth since 2002 last week and can win the AFC West and earn a first-round bye by winning next week in Denver or if Kansas City loses one of its final two games. But that is all secondary to Carr’s health. The third-year quarterback has led a resurgence in Oakland with 28 TD passes and seven fourth-quarter comebacks this season. Now the Raiders may have to prepare for life with Matt McGloin at quarterback. Carr got hurt with Oakland leading 33-14 early in the fourth quarter when he was sacked by Trent Cole. Carr stayed on the ground for several minutes in pain as trainers came out to treat him. With the crowd chanting “M-V-P! M-V-P!” Carr limped off the field without putting any pressure on his right leg. He was then taken away on a cart. Indianapolis (7-8) will not make the playoffs. FOXBOROUGH, Mass. -- Tom Brady passed for 214 yards and three touchdowns , and the Patriots moved a step closer to securing home-field advantage throughout the AFC playoffs. A loss or tie by the Raiders against the Colts later Saturday would officially give New England the AFC’s top seed. Malcolm Butler added two interceptions and a fumble recovery , and LeGarrette Blount had a pair of 1-yard touchdown runs. New England (13-2) took advantage of New York miscues all day, scoring on three of its first four possessions. The Jets (4-11), who have lost six of seven, had four turnovers. The only really good piece of news for the Jets came before the game, when Todd Bowles rejoined the team and coached from the sideline a day after a medical scare sent him to the hospital. GREEN BAY, Wis. -- Aaron Rodgers threw for 347 yards and four touchdowns, WHILE Jordy Nelson shredded Minnesota’s secondary for 154 yards and two scores. The Packers’ fifth straight win set up a winner-take-all showdown next week with Detroit for the NFC North title, while extinguishing the Vikings’ faint postseason hopes. Green Bay (9-6) built a 28-13 lead at halftime, with Rodgers accounting for all four scores. He finished 28 of 38, and shrugged off his right calf injury after scrambling for a 6-yard touchdown late in the second quarter and making a rare Lambeau Leap . Rodgers and Nelson connected for scores from 21 and 2 yards in the first half. Playing again without running back Adrian Peterson, the Vikings (7-8) had success through the air after Sam Bradford threw for 382 yards and three touchdowns, including a 71-yard touchdown pass to Adam Thielen in the second quarter. Thielen had a career-high 202 yards and two scores. ORCHARD PARK, N.Y. -- Jay Ajayi ran for 206 yards and broke loose for a 57-yarder in overtime to set up Andrew Franks’ 27-yard field goal. In winning for the ninth time in 10 games, the Dolphins (10-5) inched closer to their first playoff berth since 2008. Miami can secure the AFC’s final wild-card berth as early as Sunday if Denver loses to Kansas City. Denver needs to win its final two games to make the postseason, and Baltimore is eliminated from the wild-card race and can only make the playoffs as the AFC North champion. The Bills (7-8) were eliminated from contention and extended the NFL’s longest active playoff drought to 17 seasons. Buffalo’s drought is tied for the fifth longest in NFL history, and is the longest since the New Orleans Saints went 20 years before qualifying for the playoffs for the first time in franchise history in 1987. Ajayi is the fourth player in NFL history to have at least three games with 200 rushing yards in a season. Earl Campbell, OJ Simpson, Tiki Barber are the others. Franks forced overtime by hitting a career-best 55-yard field goal with 6 seconds remaining. SEATTLE -- The Arizona Cardinals continue to give the Seattle Seahawks headaches at home. This time, it will likely end up costing Seattle a first-round bye in the playoffs. Chandler Catanzaro hit a 43-yard field goal on the final play. Seattle rallied from a 31-18 deficit, scoring two touchdowns inside the final three minutes to pull even 31-31. Jimmy Graham had a 37-yard touchdown catch and Paul Richardson’s 5-yard TD with 1:06 left tied it. Steven Hauschka missed the extra point that could have given Seattle the lead, but it didn’t matter in the end. Arizona went 50 yards in the final minute and Catanzaro’s kick was good, delivering a huge blow to Seattle’s chances at the No. 2 seed in the NFC. It was the Seahawks’ first home loss this season; all NFL teams have now been beaten in a home game. CHICAGO -- Kirk Cousins threw for a touchdown and ran for two more, and the Redskins gave their fading playoff hopes a boost. DeSean Jackson added 114 yards receiving, and Washington (8-6-1) intercepted Matt Barkley five times. Eighth in the NFC behind Green Bay and Tampa Bay coming in, Washington scored 14 points in the first quarter after struggling early in recent games, and never really was threatened by the Bears (3-12). Cousins, shaky against Carolina, was 18 of 29 for 270 yards. He threw a 17-yard touchdown to Chris Thompson in the first quarter and scored on a 9-yard run in the second. He also pushed in from the 1 late in the third to make it 31-14. LOS ANGELES -- Colin Kaepernick threw a 10-yard touchdown pass with 31 seconds remaining and scrambled for a go-ahead 2-point conversion as the 49ers overcame a 14-point deficit to end a 13-game losing streak. Kaepernick rolled to his right while looking for a receiver before tucking the ball and barreling into the end zone. That gave the 49ers a sweep in the renewal of the instate rivalry with the Rams’ return to Los Angeles this season. Kaepernick threw for 257 yards, two touchdowns and one interception and rushed for a touchdown for the 49ers (2-13). Kaepernick found Rod Streater on a slant pattern to cap a 10-play, 73-yard drive to make it 21-20. Jared Goff was intercepted by Rashard Robinson with 16 seconds left as the Rams again squandered a late two-score lead for the second time in their past three home games. Goff, the No. 1 overall draft pick, has lost all six of his starts for Los Angeles (4-11).